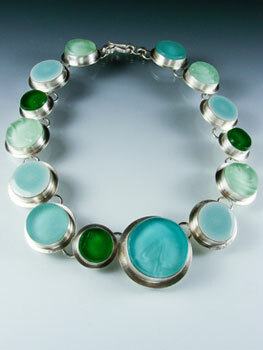 14 circular bezels of fine and sterling silver are set with hues of the sea. Emerald, sea green and aqua glass are cut from vintage recycled bottles and combined with ceramic titles in soft turquoise blue. The entire length is 15" the largest circle is 1 1/4" in diameter. Made from 100" recycled silver and glass.